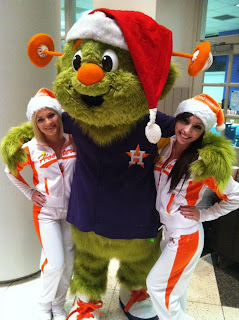 Orbit and hot chicks. A powerful deception tactic. Opening Day for Major League Baseball remains one of the most exciting days of the year. There are few things in life more enjoyable than kicking back in a seat and relaxing, while surrounding yourself with thousands of like-minded folks watching America's past time. I think it was former Houston Chronicle sports writer Richard Justice who once discussed the splendor of professional baseball by writing that watching a bad baseball game is always better than watching a good football game. Ever since we lost the Oilers around here, his words certainly ring true. Taking in a MLB game is still one of the best ways a human can spend three hours. However, in these parts, the beginning of baseball season marks a time when the local ball club makes people believe I'm somehow affiliated with them. Every year, year after year, the same thing happens. They utilize the local media to make fans believe they are bringing me on board. And year after year, I receive no phone call from them and no tickets arrive in my mailbox. Don't believe me? Watch the coverage on Houston's Fox affiliate this morning (all four hours). This is just one example, but I encourage you to roll back the coverage this morning from all the local TV news. This city is being mislead by this organization (and has been mislead for years). The good fans in Houston aren't stupid, but they're sure treated like they are. They know darn well that I have protested this dishonesty by wearing Dodgers and Angels gear to the ballpark each time I visit in past years, including on Opening Day. I also wear Dodgers and Angels gear all over the Houston area. The Astros have been a strange organization. They demand loyalty, but don't give any in return. I'm not being difficult here. I'm being mislead, and that disappoints me. Especially when that dishonesty originates from an organization that was one of the great loves of my childhood. So while I won't join the sell-out crowd tonight at Minute Maid (unless the phone rings before 6 p.m. with the offer they are lying about), I will try to find the Dodgers game on TV or online. Here's the National Anthem. Now play ball!